What Is Bragg's Liquid Aminos? Curious about that yellow-labeled bottle that sits on the condiment shelf at so many natural grocery stores and vegan restaurants? 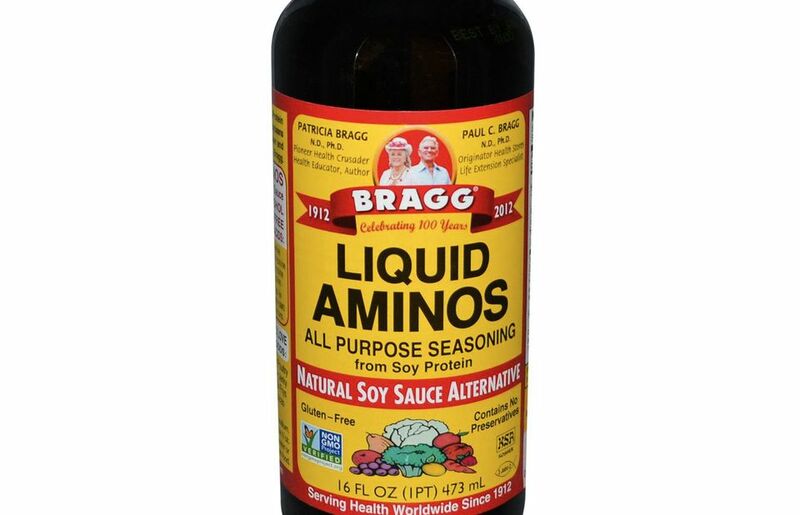 Bragg's Liquid Aminos is a very similar condiment to soy sauce. This salt-free seasoning sauce is made from soy and water and is purported to be a healthier alternative to soy sauce. Bragg's is made from nothing but soy and water, whereas soy sauce often has added ingredients, such as salt, alcohol, and preservatives. All of Bragg's soybeans are non-GMO and are verified by by Non-GMO Project. Bragg's gained popularity in the health food trend started in the 1970s and, unlike other 70s health trends such as barley, macrobiotic diets, and carob, never really went out of fashion. Bragg simply lists Bragg's Liquid Aminos as being naturally gluten-free. They are made from nothing but soy and water. The product does not carry a gluten-free certification. Bragg's Liquid Aminos is vegan. The soybeans are unheated and unfermented during processing, so some people include Bragg's on their raw vegan diet. But because of the processing, many others choose to exclude it. For a truly raw vegan soy sauce substitute, try nama shoyu, or make your own homemade raw vegan nama shoyu. What Does Bragg's Liquid Aminos Taste Like? Bragg's tastes similar to soy sauce but is much milder and a has a tiny bit of sweetness to it. The product tastes closer to tamari than regular soy sauce, which is a bit stronger and saltier. Most people find the taste quite pleasant, though it's a bit more mildly flavored than tamari. You will have to decide for yourself which you prefer as a condiment and which you like in cooking, such as in making a vegetable stir-fry. Buy a small bottle first and see if you like it, and, if you do, you'll likely want to purchase the biggest bottle you can find, after that. There is debate over whether Bragg's Liquid Aminos are healthier than regular soy sauce, tamari, or nama shoyu. Some people swear by the health benefits of Bragg's, others say it's all unsubstantiated, and still others say it's actually harmful. Bragg's Liquid Aminos contains no chemicals, artificial coloring, or preservatives. There is no added salt, but it does contain 320 milligrams of salt per teaspoon from concentrating the sodium that occurs naturally in the soybeans. This is similar to regular tamari sauce. The product is not recommended for a low sodium diet. Compare this to coconut aminos, which adds salt but has only 79 to 120 milligrams of sodium per teaspoon, and regular soy sauce with over 800 milligrams per teaspoon. Perhaps intentionally, it is a bit difficult to sort out truth from the fiction when it comes to the Bragg's brand, the exact recipe, and the individuals behind it. Brand founders Paul Bragg (deceased) and Patricia Bragg maintain a bit of an aura of mystery behind both their personal lives and the process of creating Bragg's. The manufacturing process and exact recipe remain a secret. Consider that you're not drinking gallons of the stuff, you're putting a teaspoon or maybe two on your veggies or in your sauces. It's certainly better for you than commercially produced soy sauce, which contains additives and preservatives. One downside to Bragg's Liquid Aminos is the cost, since it's a bit pricier than other options. If you're an occasional user, it may be worth it; if you use it frequently, the cost can be a factor.